Pen-and-ink drawing of sculptured figure of a standing Jain Tirthankara at Vijayawada in Andhra Pradesh, from an album of 37 drawings (43 folios), including one duplicate, of sculpture at Jajpur, Puri, Bezwada and Sitanagar made during a journey from Bengal through Orissa to the Coromandel Coast, dated 1815. Vijayawada, formerly known as Bezwada, was an important centre of the Vishnukundin rulers in the fifth-sixth centuries. The city was taken by the Early Chalukya (later known as Eastern Chalukya) of Badami and became the headquarters of their eastern domains. The strategic position of the town commanding the coastal trading routes of the Bay of Bengal determined its economic importance through the centuries. It is surrounded by picturesque hills with the river Krishna flowing on the south. The remains of Buddhist structures at Vijayawada suggest that there must have been a monastic establishment. When the Chinese pilgrim Hiuen Tsang stayed in a monastery in 639 he already noticed the decline of Buddhism. There are five rock-cut cave-temples which were excavated during the Eastern Chalukya period in the 7th century in the hills outside the city centre. The caves have porches with undecorated squat columns and inside have carving of various divinities. In the west part of the city there are other two cave-temples. 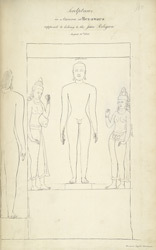 This drawing represents a sculpture from a rock-cut cave temple, depicting a figure of a naked standing Jain Tirthankara or saviour, flanked by two female figures.